Spontaneously, I find things everywhere that I’d like to paint. So, I rely on a pretty wonderful exemplar of modern technology, the digital camera. I’m inclined to continually scan my surroundings for the subject or combination of subjects that lifts my interest from ‘same old, same old’ to ‘hmmm, that’s interesting’. I find it intriguing that even when I try to close this ‘art eye’ survey of the things around me, I cannot, so I pretty much have to carry that camera around as my silent companion. And what is it I’m seeking? Well, I look for the exhilarating; the combination of light and form that, with the best virtue of all- COLOR, makes my heart and senses expand. I have to love an image to paint it. Once I’ve chosen an image, I have to consider the technical part of actually painting it in my chosen media, transparent watercolor. 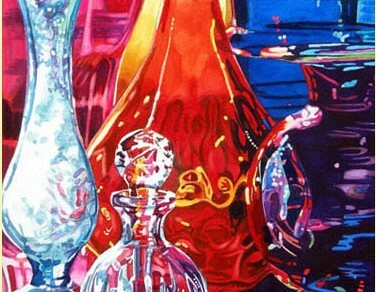 Transparent watercolor almost magically allows the white of the paper to glow through the paint allowing for a stimulating luminosity of any colors used. All my paintings start just as a promise but soon develop a life of their own. I begin by empting my mind, turning off my ‘thinking’ and I start to paint. Then the canvas takes over. So much so, that sometimes I’m even surprised at its development. When I start, I love everything about a painting, yet each painting goes through an ugly phase, which is what I call the ‘underwear stage’. Usually that is when the painting starts to take over and my control over its development is lost, nothing seems to be working right. But near its completion I see where I’ve been taken and mostly I’m happy, often excited, with the result. For this web site, I have chosen paintings whose subjects are from various images that I’ve culled from around the country. I really like to zoom in, get up close, move into and be enveloped by a subject. And as I investigate these vibrating splashes of color and form, I want to capture that ability to enchant into my paintings. I absolutely love the palette that parades from the world around us and I try to express in my paintings that flush of feeling I get from that color and close focus inspection. But I also hope to give my imagery an edgy, kinetic kind of expression, too, with repetitive forms and strong light sources. As almost all subject matter is in constant flux and pulsing with life, it offers me, as the painter, the option of electrifying the viewer with a barrage of information and by mixing in that double whammy of close up and colorful, it is, simply put, my ‘artist’s statement’.